Hello my friends, I hope your day is happy and relaxing for you. 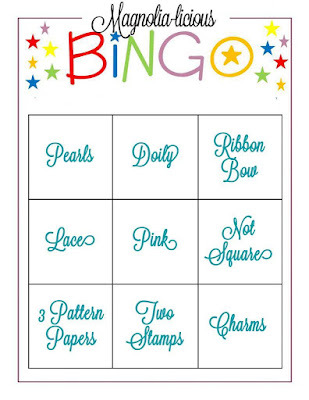 We have a new challenge BINGO at Magnolia-licious! 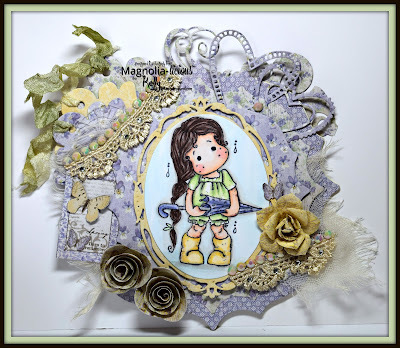 I hope you have time to check out my teammates creations, they are gorgeous! This is Drip Drop Tilda that I won from a Shutter from Magnolia VIA the very talented Camilla, if you have not been to her blog, you just have to see her cards, they are stunning!!! Here is her link you won't be disappointed.! I also won the Doohickey tag die cut so I had to use them together on the card. 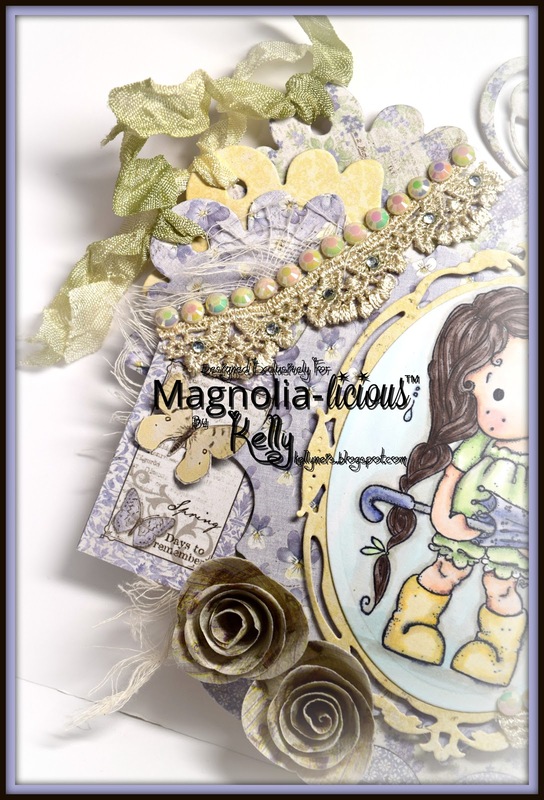 It is fun to win so I sure hope you enter our challenge and follow the rules so you can win Diana's Magnolia-licious Store certificate, the store is full of goodies! 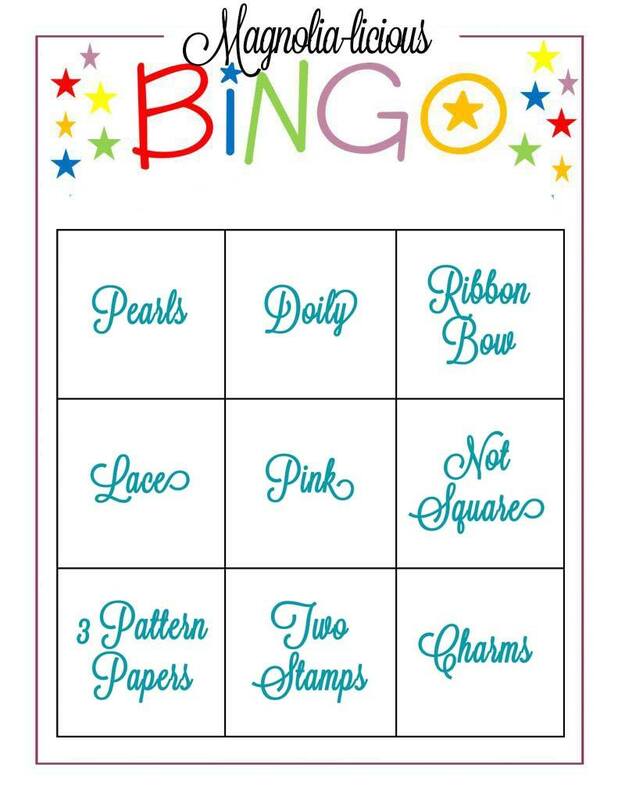 Here is the Bingo card for you to follow our challenge at Magnolia-licious Challenge, or if you like we also have the option of anything goes. More fun for you to win. Thank you for hanging out with me a while, have a fabulous day! 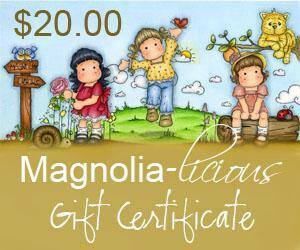 We will choose a random winner to receive the $20.00 gift certificate for the Magnolia-licious Store so please enter our challenge! Okay, this is going to sound funny, but just this week I started an experiment and after seeing your card, it's without a doubt, my findings are true. I started counting all the elements and embellishments on cards that I found truly striking and couldn't stop looking at and I realized that each of them had around 15 different types of goodies on them. From lace to gems to butterflies, to layers to flowers, etc and viola...here's yours and again, I've counted and found it falls in the realm of perfection! Your makes are always so sensational and I just have a blast finding all the fabulous pieces you put together to make them. 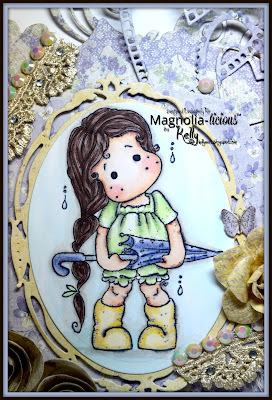 Big hugs to you, Kelly! !